• Across the 1.6 million local government workforce nationally, 77% are women. • The local government workforce is 55% part-time workers – of which 90% are women. • Over 1 million local government workers earn less than £21,000 a year, with around half on less than £15,000. • Local government workers have suffered a 3 year pay freeze, followed by a measly 1% increase this year. That is why our pay is worth 14% less than in 1999. • Many low paid workers will have experienced further income reductions resulting from cuts to benefits and tax credits. • Recent pay settlements in the UK economy have been between 2 and 2.5%. • The City Council will have shed nearly 4,000 jobs after the raft of Tory/Lib Dem cuts. This adds yet more pressure on workloads on the remaining staff. The only sensible conclusion to draw is that this Conservative and Liberal Democrat ruling coalition is toxic for local government. Central Government’s deep and savage cuts to local authority budgets, targeted at cities like Manchester have smashed local public services, increased unemployment and damaged our local economies. And its pay policies are impoverishing local government workers. To recycle a phrase, we really can’t go on like this. 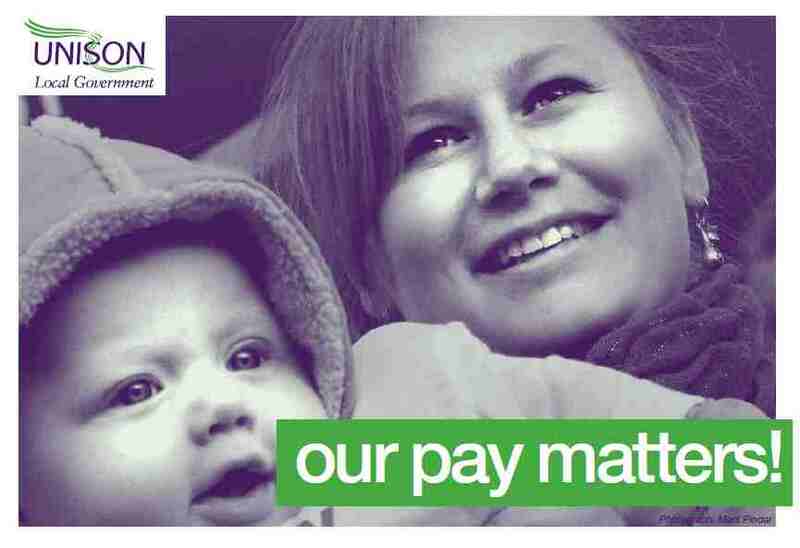 UNISON, with the other trade unions, negotiates on pay with the national employers. It has submitted a pay claim for 2014-15 for a minimum increase of £1 an hour on each scale point. This will result in those on the lowest rates of pay earning at least a Living Wage. It will also help restore in wages some (though not all) of the earning power lost through the pay freeze and inflation over the past four years. It is a pay claim that is reasonable. It will help many workers and their families who are struggling on low incomes and will boost the local economy. Unlike the bankers who caused the financial mess that this Coalition Government are forcing ordinary people to pay for, local government staff spend virtually all their wages locally. This spend enters the local economy, multiplying economic growth and spreads the benefit more widely through the community. A Living Wage helps employees and local economies alike. It is also a pay claim that we will have to fight for. You can bet that Government Ministers like Eric Pickles will hate it. They won’t like the fact that ordinary people and their trade unions are prepared to stand up for decent wages and for good public services. And to win this struggle, just as the trade union movement has won many others, we will need to be united, we will need to work hard for it and we may well need to take strike action if necessary. Support the campaign for a Living Wage, and please discuss it with friends and family, and with colleagues (and don’t forget to ask non members to join UNISON – our campaign will boost their pay too). There’s more information as ever from Stewards, Branch Officers and we’ll keep updating via the Branch website. Please note there will be a special meeting to brief stewards and contacts on the 2014 Local Government Pay Claim.